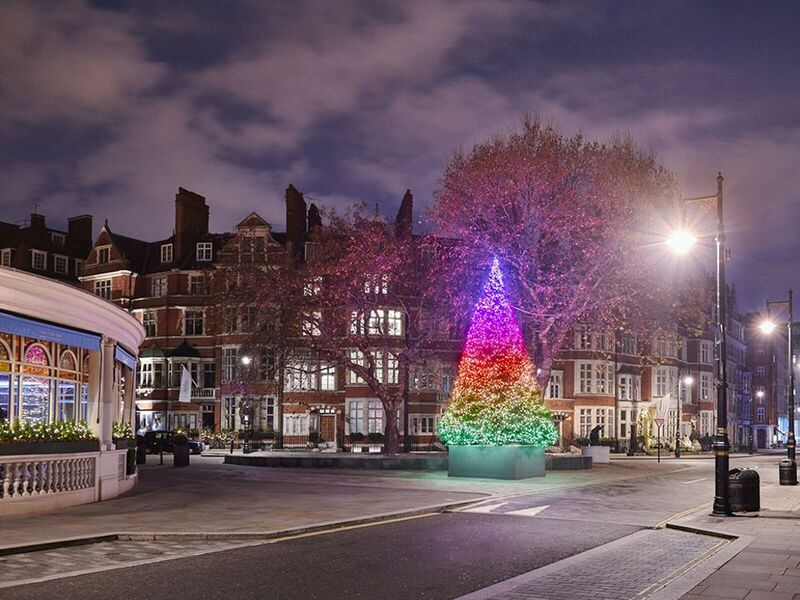 Appropriately for an artist who grew up and was educated in the USA- albeit settling in England in the 1960s - the unveiling of Michael Craig-Martin’s specially designed Christmas tree outside Mayfair's Connaught Hotel last Thursday 22 November also coincided with Thanksgiving. However the vibe was strictly Yule as Sir Michael flicked the switch on his magnificent nine-metre high Norway Spruce which sprang into an ever-changing display of illuminated colour. Over an illustrious career spanning nearly five decades, Craig-Martin has created wall drawings covering entire buildings, planted giant metal sculptures on the grand lawns of Chatsworth House – including one of a pink stiletto shoe – and notoriously once exhibited a glass of water as his 1971 work An Oak Tree. But before last week’s ceremony the artist also freely admitted that the Connaught Christmas tree had been by far his most challenging project yet. Even the turning-on process wasn't quite what it seemed. The analogue switch was just there for show, and after a shouted countdown the tree sprang into illuminated, dynamic life courtesy of a concealed assistant firing it up from a lap top. But there’s no doubt that the shifting rainbow light-show offered by this very unique Christmas decoration was certainly worth all the trouble.